Each weekday morning, the K-EARTH 101 Morning Show chooses one lucky Southern California office to become the official K-EARTH 101 Office of the Day. 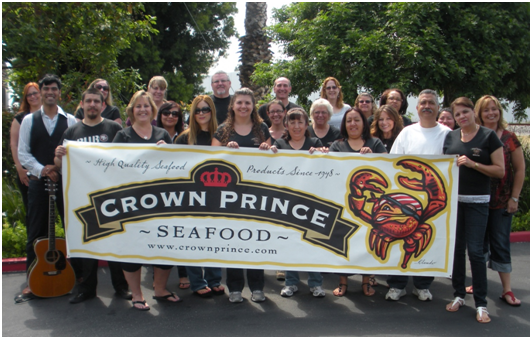 Today, they chose Crown Prince Seafood! Earlier this morning, Antonio of K-EARTH 101 brought us coffee and bagels from Western Bagel and played some beautiful music for us while we took an extended coffee break! “Crown Prince is a great place to work” says Mark, who entered us into the contest. “The owner always treats us with respect. We’re like family.” Mark has been with the company for 23 years. You can listen to his phone call on the K-EARTH 101 website. 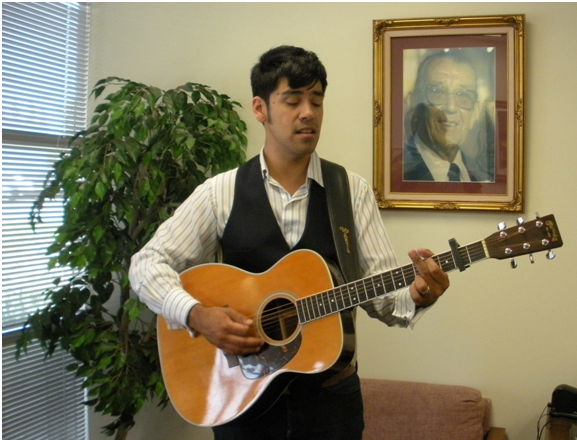 Antonio of K-EARTH 101 performs for us in the lobby, beside our founder Case Hoffman. If you work in Southern California, sign your office up to be the K-EARTH 101 Morning Show’s office of the day!